A muffler is the American term used to name the gadget that drops the noise of the exhaust system of an internal combustion engine. It is called a “silencer” in British English. Mufflers or silencers are mounted within the exhaust system, and they do not serve any primary exhaust function. They are made of sound-absorbing materials and reflect the sound waves to cancel each other out. 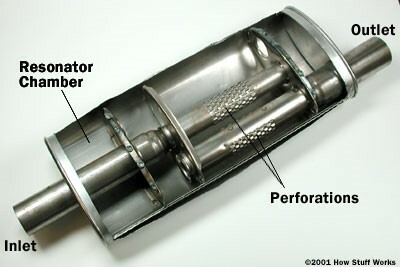 The exhaust system increases the performance of the engine by manipulating the pressure waves. It removes the exhaust gases that come out of the cylinder and flow down the pipe. It also controls the movement of the pressure wave produced by the pressure spikes. The muffler is an acoustic soundproofing device for reducing the sound of the engine through acoustic quieting. It consists of a set of chambers or pipes with some holes in them. A resonator is connected to the first chamber with a hole, and it contains a certain amount of air having a specific length capable of producing a wave that cancels out a certain frequency of sound. When the exhaust valve opens creating pulses, there will be a sudden burst of high-pressure gas entering the exhaust system. The high-pressure gas molecules will begin colliding against the low-pressure molecules in the pipe, forcing them to stack up on each other. While this happens, they mound on the molecules a little away down the pipe. As a result, there originates a field of low pressure behind them, and the sound wave moves down the pipe acquiring more speed than the actual gases. The exhaust gases and the sound waves, on entering the center pipe, are bounced and let through the hole into the main body of the muffler. On reaching it, they again go through another set of holes in the next chamber to turn and leave the muffler from the last pipe. The muffler can slow down the exhaust flow, making it difficult for the engine to expel the gas. This disadvantage of the muffler that works on the engine performance can be overcome by using sound-absorbing, glass-pack mufflers. Such mufflers are designed in a way that they do not restrict the flow of exhaust gas. The “Vector” muffler, “Spiral baffle” muffler, and “Aero turbine” muffler are other types of mufflers that are designed for optimal performances. However, some vehicle users replace the existing muffler with separate mufflers during engine tuning to increase the power output and reduce fuel consumption, which is illegal as per the existing Motor Vehicle Act. An exhaust system is a set of piping used to keep the exhaust gases away from a controlled combustion inside the motor engine. The burnt gas from inside the engine is known as the “exhaust.” The exhaust system has two operating components. The first component is related to the expulsion of exhaust gases from the cylinder. It happens when a pulse of hot gas comes out of the cylinder and moves away to the header primary tube. The second component is the movement of the pressure wave acquiring variations in the port when the exhaust valve opens. By manipulating these pressure waves occurring in the second component, the cylinder in the first component can be cleared to allow the inflow of fresh charge. When the exhaust valve opens in a four-stroke piston engine, the pressure in the cylinder will be above the atmospheric pressure, and the pressure at the valve in the exhaust port is near one bar (atmospheric). The pressure variation across the rapidly changing valve aperture allows the exhaust gas to flow through the opening, and it causes the pressure behind the valve in the port to increase quickly. Since the velocity of the exhaust gas flow at any point is proportional to the pressure gradient and the cross-sectional area at that point, a small variation in the header can increase the velocity at a given RPM. If the diameter of the header is very small, it will result in the loss of gas flow, increasing the pressure gradient. This situation may lead to offsetting the tuning gains. Therefore, the selection of tubing diameters is very relevant in designing the exhaust system. The exhaust pipe needs to be designed in such a way that it will carry the toxic and other gases, namely hydrocarbons, carbon dioxide, and nitrogen oxides, away from the vehicle user. Punalur Chandrasekaran. "Difference Between Muffler and Exhaust." DifferenceBetween.net. November 9, 2015 < http://www.differencebetween.net/object/auto-object/difference-between-muffler-and-exhaust/ >.